Melissa Made: A Wee bit of Inspiration! A Wee bit of Inspiration! Hi ya everyone! 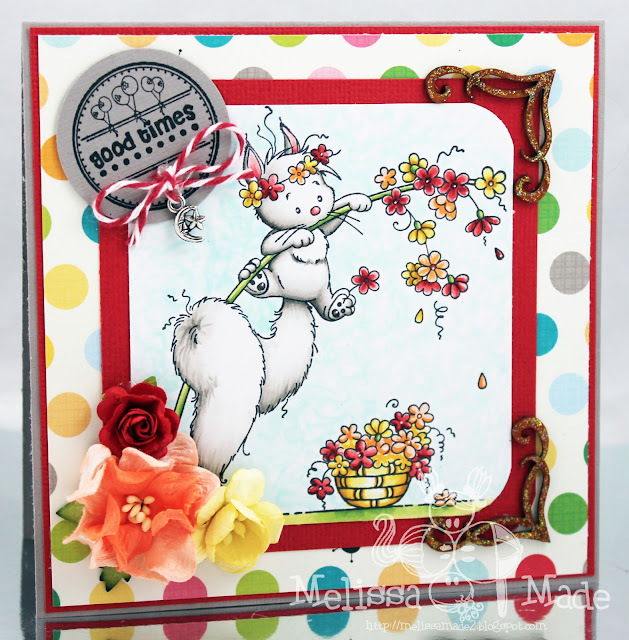 I'm excited to tell you that I'm a guest designer this month for Sylvia Zet and Wee Stamps. I have to be honest, I love these adorable characters that Sylvia the artist and owner of Wee designs. They are simply the sweetest. Since I'm a member of the Whimsy Magazine Design team I get to work with Wee Stamps all the time in rubber. Did you know they come as digitals too? All month I'll be sharing cards with Wee stamps on the blog. The above creation was made for Issue 9 of the Whimsy Stamps Inspiration Magazine. I used the adorable Fluffy Hanging in There and a number of fun embellishments including moon and star charm, ornate corners and the sentiment from the Party Mini Letter Seals. Thanks for stopping by today and make sure to head over the Wee Stamps blog all month long! What an adorable card. I love using Wee Stamps by Sylvia Set. Oh my word is she cute! Love this little image, too sweet! Oh wow Melissa, this is just GORGEOUS!! Love how you've colored Fluffy!!! Can't wait to show this on the Wee Blog! !